In this paper, we present a project of the University of Kent Graduate School that utilises this paradox of playfulness and creativity. 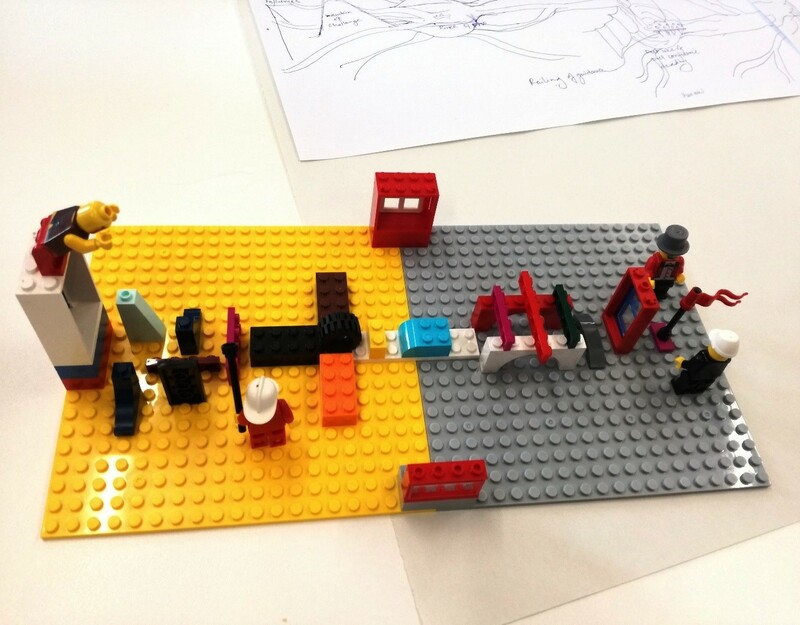 LEGO® is used in workshops to explore doctoral students’ emotions around the complex and solitary experience of a PhD research. We argue LEGO® is uniquely generative for exploring emotion work. After a brief overview of the background and context to the doctoral training workshop, we provide a brief review of emotion work. We then describe the LEGO® workshop we developed for our students, before explaining our approach to data collection and analysis. We then present our results, using verbatim statements from conversations with students around their LEGO® models. We present the interconnected building elements of height, walls and positioning, which are particularly impactful in highlighting the emotion work with LEGO® models. We connect the findings to a brief discussion in relation to the literature around emotion work. We have found that LEGO®’ bricks structure, solidity, and variety ensure its openness to metaphorical investment and promote the creation of narratives. Thus, building LEGO® models enabled participants to engage creatively with routinization of practices and emotion work, as well their positive support networks. We conclude with final thoughts on the value of LEGO® and steps for further developing the existing workshop. LEGO® SERIOUS PLAY® was created as a tool to make business meetings less hierarchical and more imaginative and playful (James, 2014: 284). 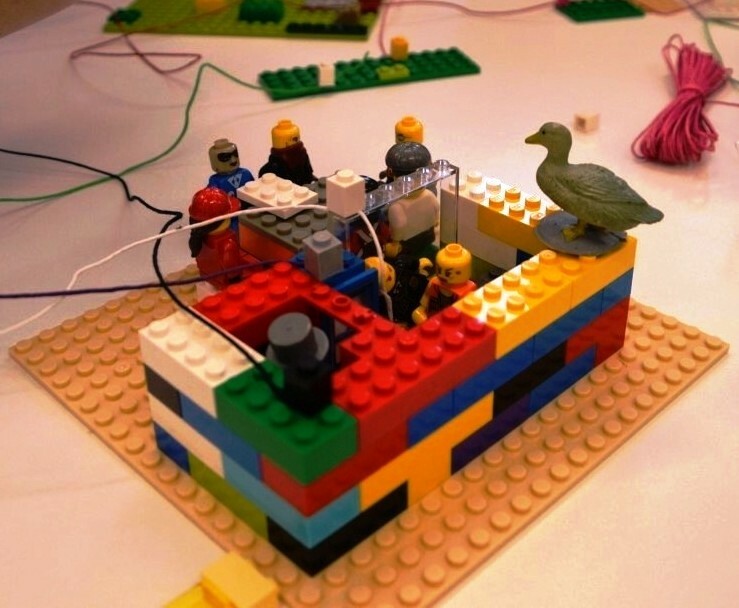 The theory behind LEGO® SERIOUS PLAY® highlights the development of connections and the achievement of common goals, emphasising how metaphors “creat[e] radically new ways of understanding things” (Schön, cited in James, 2014: 285). Research and practical experience show how the engagement in playful activities for objective-orientated ends through LEGO® SERIOUS PLAY® leads to a “paradox of intentionality” (Statler et al., 2011: 236), generating significant, serious and sensible outcomes (2011) as well as channelling emotions (Nerantzi and Despard, 2014; Nerantzi et al, 2015; Gauntlett, 2018; James, 2014). In this paper, we present a project of the University of Kent Graduate School that utilises this paradox of playfulness and creativity. 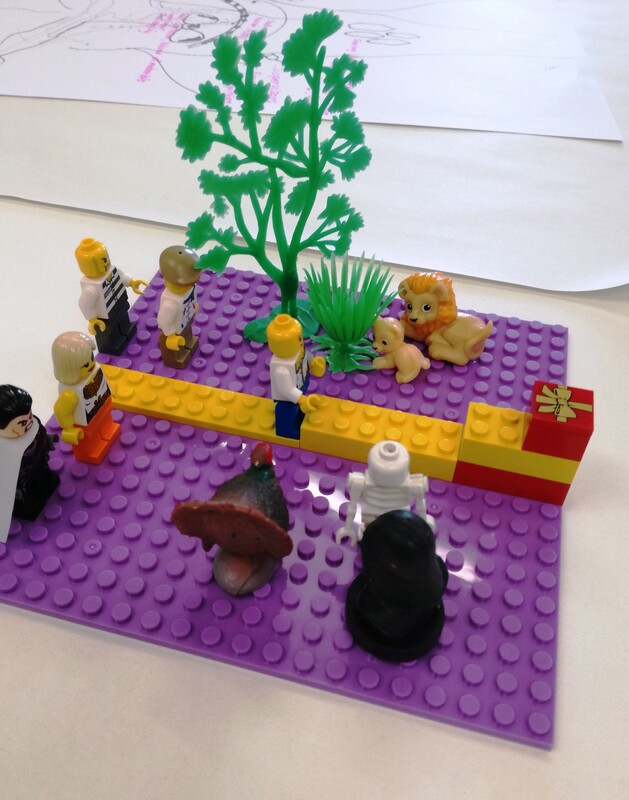 LEGO® is used in workshops to explore doctoral students’ emotions, as a first step towards wellbeing. Higher education is increasingly recognised as a pressurised environment for staff and students, and concerns around mental health issues and wellbeing are widespread (Metcalfe et al., 2018; National Union of Students, 2018; Universities UK, 2017 and 2018). Globalisation, rising social inequality, job insecurity and increased pressures to succeed are leaving university students more susceptible to mental health issues than ever before. Equally, societal changes mean that mental health concerns, work-life balance and wellbeing are becoming more openly discussed. Key stressors on PhD students include financial insecurity, job insecurity in academia and work life balance (Levecque et al., 2017). Whilst some studies have sought to quantify and measure PhD student wellbeing (Levecque et al, 2017; Juniper et al., 2012), our approach is centred on a series of workshops to provide students with reflective tools to enhance their wellbeing and resilience through focussing on emotion work. 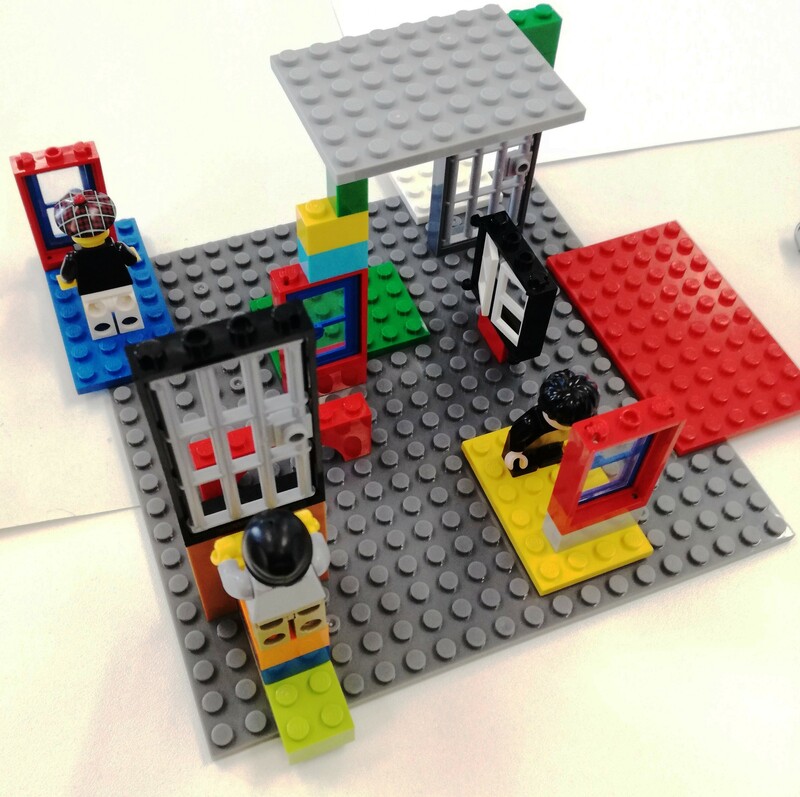 We demonstrate that LEGO® and LEGO® SERIOUS PLAY® can be used effectively to deepen students’ reflective practices, support researchers’ reflections on their emotion work, and provide them with tools to gain better understanding of their selves and in turn aids wellbeing. We argue LEGO® is uniquely generative for exploring this kind of emotion work and that the same goal would be difficult to achieve with other forms of expression. After a brief overview of the background and context to the doctoral training workshop, we provide a brief review of what emotion work is. We then describe the LEGO® workshop we developed for our students, before explaining our approach to data collection and analysis. We then present our results and a brief discussion of the findings in relation to the literature around emotion work. We conclude with final thoughts on the value of LEGO® and further steps for future developments. The mission of the Graduate School at the University of Kent is to provide researcher development training, as well as to support an excellent social and academic experience for the wider postgraduate community across all faculties and schools. Within that work, we have realised over the years that we need to consider the PhD experience on its own terms, as distinct from undergraduate or Master’s level provisions, as PhD researchers face challenges that other students do not have to contend with. Above all, doctoral students experience isolation as a serious issue (Metcalfe et al., 2018. PhD students may well belong to a discipline, but their area of interest within that field means that they are working solitarily and in isolation and miss a certain sense of community. For the PhD students, the research project itself might be troubling, as the working process is unstructured and uncertain. Researchers often do not know what they are going to find exactly before they find it, yet conceptual sophistication is required, as after all the PhD needs to represent a significant contribution that advances one’s discipline (Lesham and Trafford, 2007). The doctoral research and the PhD journey also represent an initiation (Skakni, 2018) or transition to professional status. Again, this positions the PhD student as novice or apprentice until the PhD is achieved (Beeler, 1991). Additionally, doctoral researchers often assume teaching positions and as such are positioned in a liminal space of not quite being a student and not quite being a staff member. Indeed, students describe the PhD process as a process of “crossing thresholds” (Kiley, 2009; Wisker et al, 2010), a process that is at the very least emotionally taxing (Metcalfe et al., 2018; Levecque, 2017; Juniper, 2012). Within the scope and space of informal meetings at Kent University’s research café, PhD students have regularly reported concerns around wellbeing. We responded to this by designing workshops, which we offer to all PhD students within the University of Kent. The workshops provide participants with reflective tools, which, if applied consistently, help students understand their innermost emotions, concerns and needs. This recognition of personal experiences and feelings provides the first step towards developing strategies for wellbeing. At the same time, the workshops also serve as a basis for an action-research to gain better insight into postgraduate students’ views, challenges and understandings, especially in relation to wellbeing. The workshops typically address a combination of the following questions: “Who am I?”, “What does your learning journey look like?”, “What is your PhD?”, “What does your PhD community look like?”, “What does life look like when you have finished the PhD?”. In the workshops, students are required to respond to these questions through the use of objects and metaphors or through sketching and model-making using LEGO® bricks. Through the process of reducing an experience to its essence and subsequently elaborating on that essence, students implicitly learn how to reflect deeply. Research has shown that creative methods can be empowering for participants, as they are able to engage in emotion work (James, 2014; Gauntlett, 2018; Brown, 2017; Brown, 2018) and the role of playfulness and creativity has also been addressed (Brown and Leigh, 2018). The relationship between the doctoral experience and emotions has been explored for decades and is therefore well-documented. Herman (2010), for example, explores a wide range of emotions in relation to the activities of doctoral students, from carrying out research through to writing up. Similarly, Saunders et al. (2010) highlighted that emotions are integral to the learning journey of doctoral research. In existing literature, this is largely attributed to the fact that research is considered a process of personal development (Reason and Marshall, 1987); a journey that is emotionally so taxing that it leads to doctoral students dropping out (Devos et al., 2017). The emotional rollercoaster of the doctoral research and the tensions emerging from the experiences are also the focus of Cotterall's (2013) research. Research relating to emotion work or emotional labour as defined in sociological literature is less prominent within the context of doctoral education. Where emotional labour and emotion work was used as a lens to understanding emotions within doctoral education, the management of emotions around writing and around family relationships was seen as central (Aitchison and Mowbray, 2013). Within sociological discourses emotion work and emotional labour are largely associated with public-facing professional roles, such as nursing, policing or teaching (Zapf, 2002), a development that began with Hochschild's (1983) research around the emotion work of flight attendants. Since that initial study, emotion work and emotional labour have been defined and re-defined in a myriad of ways. However, the overarching understanding continues to be that emotional labour and emotion work relate to work that involves dealing with the feelings of others (James, 1989). For Hochschild (1983), emotional labour involves aspects of employment, such as work for or with a client or customer, for which pay is then received; emotion work by contrast is the management or regulation of one's emotions in a private and personal context. In reality, emotional labour and emotion work are strongly connected to and influenced by one another. Amongst female doctoral students this connection is particularly strong where personal emotions around the doctoral research and commitment to family and relationships are concerned (Aitchison and Mowbray, 2013). Emotion work amongst doctoral students must, however, go deeper. The teaching profession, for example, includes the display of emotions that are not felt, the purposeful evocation in order to feel a specific emotion and the suppression of emotion (Näring et al., 2006). Teachers undertake these activities and actions in order to regulate their pupils' emotions and to manage the classroom. Teachers’ intense emotion work is particularly evident when considering the caring aspects of the profession (Isenbarger and Zembylas, 2006). Yet, displaying or suppressing emotions also help manage and regulate one’s own emotions. Within nursing, for example, professionals manage their feelings to ensure they meet the standardised expectations and societal rules of appropriately or inappropriately displaying particular emotions in specific circumstances (Kinman and Leggetter, 2016). The connection between emotional labour or emotion work and burnout and wellbeing (Näring et al., 2006; Kinman and Leggetter, 2016) is therefore not surprising. Doctoral students are often engaged in teaching, and therefore they necessarily undertake elements of emotion work and emotional labour. However, in their research work, too, they encounter situations where they are faced with emotion work. Research is not necessarily a clinical process but an embodied experience, where topics and engagements with research participants will affect researchers (Dickson-Swift et al., 2009). Emotion work in this context relates to the very personal level of coping with difficult developments, and getting through uncomfortable situations and emotions. Emotion work therefore becomes part of and integral to identity work (Winkler, 2018). Identity work itself is the complex, “cognitive and emotive process” (Fitzmaurice, 2013: 622) of actively constructing, defining, redefining one’s identity, which in turn is flexible, fluid and continues to be under construction (Giddens, 1991). This process is particularly taxing on doctoral researchers, who are socialised both into a profession and specific set of practices and ways of knowing (Golde, 2005). For international students this may be overlaid by other levels of local and national enculturation (Matheson and Sutcliffe, 2018). Additionally, doctoral researchers are required to “writ[e] a text and writ[e] a self at the same time”, an “identity work” process that can often be emotionally challenging (Kamler and Thomson, 2014: 16). Indeed, one seeming constant of the enmeshed “emotion work” and “identity work” that take place during doctoral studies is suffering (Skakni, 2018). In our workshops we explore PhD students’ emotional work by asking them to undertake affective practice through LEGO® modelling to specific prompts. This term is borrowed from Wetherell’s (2012: 4) notion of affective practice which “focuses on the emotional as it appears in social life and tries to follow what participants do”. Wetherell designates affect as “embodied meaning making […] something that could be understood as human emotion” (Wetherell, 2012: 4), and describes how affect can flow: from person to person as in contagious laughter, as well as through images, in political movements and the like. However, emotions are not simply chaotic; Wetherell argues that affect can be patterned, where “The interrelated patterning of affective practice can be held inter-subjectively across a few or many participants” (Wetherell, 2012: 14). Emotions are also enmeshed in power relations, and indeed, patterns can solidify over time, into “particular kinds of emotional subjects” who deploy emotional work and emotional labour to manage emotions according to dominant socio-emotional logics (Wetherell, 2012: 14). Our framework, by drawing out the intricate play between emotion work and affective practice, offers a complement to James and Brookfield’s (2014) consideration of LEGO® SERIOUS PLAY® through emotional intelligence. Our research approach is strongly linked to our teaching philosophy underpinning our practices within higher education. For us, teaching practices are intrinsically connected with and require deeply embedded reflective practice on the part of the lecturer in order to lead to development and improvements of teaching approaches and strategies. We see delivering a workshop as an opportunity for a practice-based enquiry. Research in this context is reflection in action and on action (Schön, 1983) and connects research with teaching for a strength-based education (Fung, 2017). In practice, this basic principle of connecting teaching with research translates into action research. Over the decades, action research has seen different kinds of definitions, conceptualisations and categorisations. 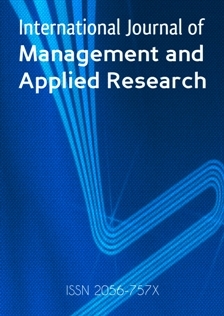 The widely accepted understanding is that action research focuses on improving practices (Lewin, 1948), the personal professional transformation in the researcher (Elliot, 1991) and its potential for providing professional theorisation of what happens in social settings (McGinty and Water-Adams, 2006). Within primary and secondary education settings, action research is commonly employed within classrooms to identify and observe changes to existing teaching practices. In such contexts, the classroom and its inhabitants are the action research project, with pupils and teachers being active research participants who engage in cyclical processes of observation, action and evaluation (Corey, 1953). Within the context of higher education, especially at the level of doctoral training, students in general, and those at the University of Kent are less used to practice-based enquiries being carried out. This shaped our approach to research. In practice, we offered workshops and students could opt in to be part of the research, which meant that we would record their contributions. If students decided not to opt in to the research, they were still able to attend the workshop to learn the reflective tools, but would not have had their contributions recorded. The registration process for the doctoral training workshops required students to sign up voluntarily to attend a workshop. For the LEGO® workshops the registration process included information to ensure students were aware of the connection between the workshop and the research. At the beginning of the workshop students received detailed explanation of the research aims and process, information around participant consent, the benefits of the research, and the context of ethical oversight and approval of the project. Data collection was therefore an organic process and emerged from the workshop activities. Due to the nature of the workshops being offered as non-compulsory, additional research development sessions, all doctoral research students were invited to attend. In practice, by far not all doctoral students are reached, and indeed only a small number of students attended the LEGO® workshops. This paper therefore reports on a random sample of 15 students, who would have the shared characteristics of being interested in creative working methods, identity and emotion work and understanding of the self. Our primary aim was to investigate the experiences of PhD students; for example, the challenges they faced, whether they experienced feelings of isolation (socially, or due to the specialist nature of their subject area), or uncertainty about their status (Beeler, 1991). To this end, we recorded the models, drawings and objects in combination with students’ explanations and discussions around the artefacts. The data we analysed for this paper was taken from the discussions and explanations of eight doctoral students. We considered as data the students’ explanations and conversations as well as their LEGO® models. We transcribed all explanations and conversations and entered them into NVivo alongside the photographs of the LEGO® models. We see analysis as an active process of meaning-making on the part of the researcher, who seeks out “hot spots” (MacLure, 2011: 1003) and follows “gut feelings” (ibid: 1004). From our observations in the workshops we noticed that the LEGO® models became a powerful tool for self-expression, which helped PhD students develop better understanding of their own emotions. With this in mind our analytical work focussed on that aspect. We, therefore, specifically scanned and coded for examples and evidence around emotional experiences and emotion work. In this section, we present the emotional experiences expressed in and through the LEGO® models. We noticed specifically that the LEGO® models represent active emotion work, where the emotions explored are experienced positively as well as negatively. In the following, we concentrate on interconnected building elements that are particularly impactful in highlighting the emotion work with LEGO® models: height, walls and positioning. Although in Figures 2, 3 and 4 height was depicted in different ways, there was a common thread of height reverting back to and representing hierarchy. Figure 2 associated height with the student’s academic department, which was symbolised by an office, and in Figures 3 and 4 specifically with the supervisor, depicted with a top hat. Models generally also associated achieving the PhD with physical ascendency. The successful PhD defence was represented by a stage higher up at the end of a longer journey. In Figure 1, the student even chose a special LEGO® brick shaped in the form of a present to highlight that ultimate goal. In these models, variable height was also used to evoke the emotional ups and downs of the journey. Isolation was indeed a key theme: the figure occupying the wall, the figure being pulled through the transparent wall, the figure on the obstacle course –all of these figures were positioned or re-positioned alone. While crossing thresholds and experiencing a self constantly open to revision and redefinition through criticism of the project, supervisory reviews, experiences such as conferences, was a common experience, it was nevertheless intensely personal. This is illustrated by the traveller climbing the staircase (Figure 2), who was positioned in relation to others who shared an office space, but was nevertheless undertaking a unique personal journey that only s/he was equipped for, which was represented by a flashlight and backpack. This echoes the student who suggested that once PhD level is reached, immersing yourself in a specialism is also a form of insularity. Walls were key symbols of students’ belonging within their schools or communities of practice. Walls for some students demarcated schools or "nice offices" (Figure 2) in a way that delimited community (Figure 4). One student occupied the wall as an emissary of his department to non-specialists. For one student the PhD was punctuated by thresholds, where boundaries signalled not just changes in thought, but changes in the person (Figure 5). Nonetheless, it was still possible to feel alone within a community due to the specialist nature of the research project, "you can feel so extremely isolated, even when you are in a nice office, still there’s about 70 percent of your life [your research] that you can't share". Significantly, these themes of status, emotional fluctuations and belonging cluster around students’ schools. Departments and research groups are thus keys in establishing and reinforcing routinization of practices through emotion work. As one student put it, "the School […] actually try to make us PhD students feel that we are part of them". The students discussed communities of practices positively, yet, at times, norms, routines and expectations erupted into the conversation to reveal emotional pressure uncovering emotional dissonance. One student who had been initially positive about her department in terms of equality, integration of students, and work life balance disclosed that a deadline was "choking" her. Indeed, the student described how she "couldn’t help" putting life on hold to complete her work. Suffering is implicit too in the obstacle course (Figure 3), a lone figure occupying the wall standing against and outside of his core community, and a model which depicts tigers prowling the space of the initial territory of the PhD. The work provided students with space and scope to explore the emotional work they were already doing in the institutional context. They were thus able to construct alternative understandings through the affective practices of reflecting and building LEGO® models in response to specific prompts. This can be illustrated through the eruption of laughter in the workshop. In each of these instances, a student revealed an uncomfortable truth about underlying assumptions in academia: the notion that works on the thesis supersedes everything else, the difficulty of building a supervisory relationship, the isolating effect of the PhD. The laughter erupts as emotional dissonance surfaces: the first around the way that students are supposed to feel, namely devoted to the PhD research at all times; the second around revealing that emotion work is a key part of building a supervisory relationship; and the third around the uncomfortable disclosure of the intense loneliness of the PhD process. The model making showed the fundamental uncertainty or "provisionality" of identity in the PhD process: that a student could oscillate between feeling embedded in a community, and feeling isolated. Indeed, the models showed that both could be felt simultaneously. The student who underscored how her department made a great effort to integrate PhD students as peers also reflected: "for now I'm like okay, if I am stuck somewhere [I] do not have somebody to talk with[. …] I know that the level of work that we are required to do also means that we need to make more time for our […] personal research, but then, once in a while we do need to come together". This pendulum between the individual and the “group” also suggests the double-bind of simultaneously building both loyalty to and a degree of dissent from particular forms of knowing at the heart of the process of PhD research. Although some students showed themselves taking the PhD journey alone (the lone figure in the blue, the figure attempting the obstacle course), the workshop itself provided a way for students to understand the common challenges they faced. One student described this as “fascinating”, “moving”, and “encourag[ing]”, another as “beautiful”. Within the workshop students were able to temporarily transcend such isolation by recognising and discussing common themes in their LEGO® models. In particular, as Golde (2005) points out, students are “socialized” into particular disciplines, and it is around this, or the school as an institutional symbol of the discipline, that ‘belonging’ emerges or not. Our findings build on Skakni’s (2018: 940) investigation of how students “adjust to the reality of their academic context and appropriately handle its requirements and expectations”. Skakni (2018) concentrates on how this takes place institutionally through “routinization of practices” (Giddens, 1984), where students adjust to the norms of their academic environments. Where Skakni (2018) explored the social aspects of this adjustment, we have investigated the emotion work occurring in choosing to locate oneself inside or on the edges of a school or department. As discussed, the workshops revealed how some students felt embedded within an academic or even, although less so, a larger university community, and even those who felt that they ‘belonged’ could nevertheless be isolated (see Pyhältö and Keskinen, 2012). This echoes Skakni’s notion that PhD students are expected to both be “autonomous”, yet “conforming” (2018: 935). Furthermore, students characterised their identities as “liminal” (Beeler, 1991; Golde, 2005) through the positioning and moving of figures representing them: the student occupying the wall boundary, a seemingly static position which is nevertheless a journey; the student who saw himself as being pulled through a transparent wall to meetings, away from the comfort of the office; the student who travelled through the doorway to her office and future studies; and the student who saw himself travelling into the ‘unknown’ blue area of his studies away from prowling tigers. Students also defined their identities ‘relationally’, where their PhD journeys often involved other students, or were possible through familial support, or supervisory guidance. Building models using LEGO® bricks offered students a way to grasp some of the ways they had been transformed by the PhD journey. This transformation was often experienced in different ways at different parts of the journey that is culturally, professionally and/or intellectually. While the LEGO® figures were themselves static, the positioning of the characters in the ‘territories’ demarcated symbolised how students’ identities were continually redefined. This clearly contradicts the Expressive Therapies Continuum (ETC) notion that LEGO® is static (Taylor and Statler, 2013). Skakni (2018) argues that a norm of doctoral study is that students ‘suffer’ as part of the PhD. The ups and downs of the obstacle course model, with the supervisor waiting at the end, evoke how tackling these obstacles confers status for the student achieving a PhD. Conversely, as Metcalfe et al. (2018: 11) argue, it is this very level of expectation that makes the PhD stressful: “Expectations of high achievement and high workloads associated with doctoral degrees may create an environment which can trigger imposter syndrome in PGRs who experience self-doubt” (see also Skakni, 2018). Suffering emerged particularly in students’ attempts to demarcate a space for research which did not ultimately encroach on other areas of their lives. There was an understanding amongst the students of “the level of work that we are required to do”, and that whilst “there should be a balance between my work life and my […] outside life”, not prioritising work leads to a sense of guilt. Skakni (2018: 941) refers to this as the “self-sacrifice norm”. The context of the workshop, which asked students to engage with their wellbeing prompted emotional dissonance around this theme. Our workshops offered an environment where through the means of building LEGO® models the emotional work of the PhD could be reflected on. In the workshop students were actively undertaking affective practice. The affective practice of creating models of the PhD journey, together with discussing the meaning of the model, revealed three key areas that Wetherell (2012) characterises as affective practice, or emotional meaning making in its broadest sense: emotions flow (13) – as with laughter, from person to person; they are patterned (15); and are caught up with power relations (16). Patterning, which Wetherell describes as being ‘held inter-subjectively across participants’ (14), was evident when we asked participants to connect their models where they found similar themes. Wetherell describes patterns as ‘threads’ and these were literalised for participants in connections of walls and boundaries (as thresholds of belonging), offices (as safe spaces) and supervisors (Figure 6). Power relations emerged in the normalisation of suffering to the detriment of wellbeing, but for the advancement of the PhD. Whilst the workshop revealed areas where student wellbeing was problematic, we contend that the form of the workshop itself promoted wellbeing, in as much as the model-making with LEGO® promoted ‘flow’ (in the Positive Psychology sense): “a mental state in which a person performing an activity is fully immersed in a feeling of energized focus, full involvement and enjoyment” (Buzady, 2017: 206). Whilst we witnessed ‘flow’ in the individual participants’ immersion in the building activity, and their engagement in the reflection process, emotions arising from the affective practice were not simply individual, they circulated around the group through laughter for example. For students, this was a positive process. In their feedback they cited ‘interaction’ as important and valuable, with one student commenting “The effect of the workshop is the encouragement it’s given me”. While LEGO® might appear relatively static, in comparison to clay or other more malleable materials, it nevertheless carries form (Taylor and Statler, 2013: 600). LEGO®’s ‘structure’, solidity, and variety ensure its openness to metaphorical investment and promote the creation of narratives. As such, model-making and building with LEGO® bricks and figures foster an “embodied creativity” (Reeve 2017: 25-7) uniquely suited to “deep and personal reflection” (James and Brookfield, 2014: 117). Thus, LEGO®’s simultaneous structure and openness is particularly appropriate for the exploration of PhD students’ patterning, “routinization of practices” and emotion work around that in addition to the potentially disruptive ‘flow’ of emotions around expectations and pressures, thus emotional dissonance. 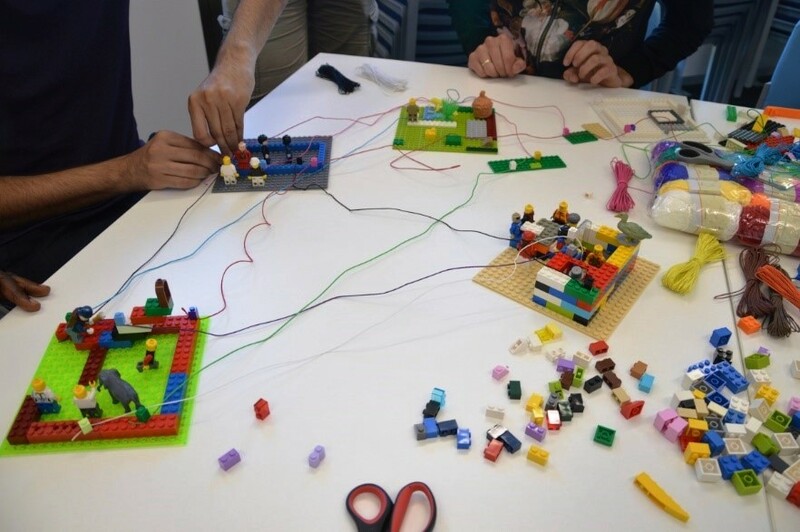 Building LEGO® models enabled participants to engage creatively with routinization of practices and emotion work, as well their positive support networks. On an implicit or explicit level participants symbolically encoded the complexity of their experiences in a way that was shared with others (flow) and was collectively recognised. 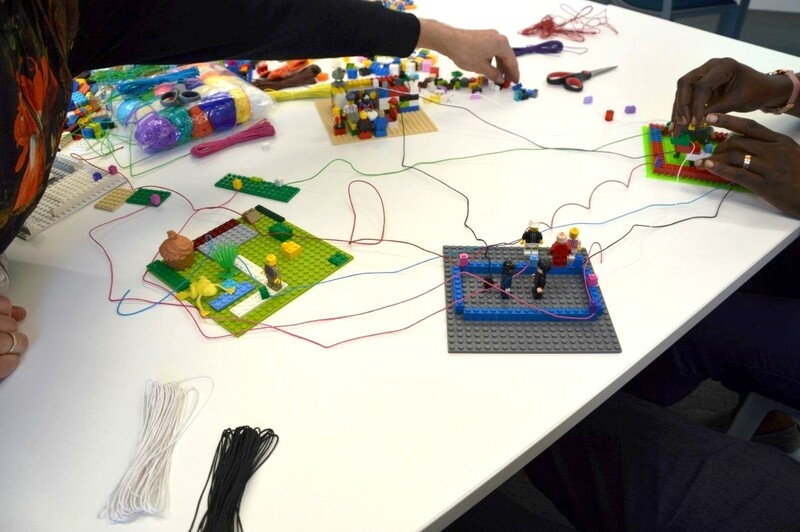 The workshops using LEGO® proved successful in exploring doctoral students' experiences. In practice, the work with LEGO® is not without challenges. Most doctoral students would have experienced LEGO® bricks as toys and as such would not necessarily see the potential of the children's toys to be taken seriously for a research context, which may well be one of the reasons for the somewhat limited uptake of the workshops. PhD students who attended the workshops were clearly open-minded to new ideas and embraced creativity, reflection and playfulness. As such, perhaps the sample of the work reported here may be somehow skewed, in that we would not necessarily have reached those doctoral students who are not engaging in reflective practices. Additionally, amongst PhD students LEGO® and reflective practice workshops may not be seen as a priority, as they grapple with the everyday routines and challenges of reading, researching, writing and teaching, although clearly, those students who attended benefitted from the time spent on exploring their personal selves. The main challenges for us therefore are to reach those students who may be somewhat reticent to explore emotion work and identity. As it is, the LEGO® models demonstrate the tensions doctoral students experience between the front-facing roles they play within a department compared to the personal, backstage persona they take on during their research work (Goffman, 1959). However, more research work would be necessary to explore emotion work and emotional labour involved in doctoral education. We intend to develop our findings and work by running further workshops. Our next activity will be to run a writing and creative retreat, which seeks to build, in a more sustained way, on our workshops’ positive work in fostering peer support. Participants will be given time to work on writing goals in a supportive environment. We will be asking our participants to consider ‘writing’ and ‘creative building’ as complementary ‘thinking’ activities, to help them re-imagine connections within their thesis, and to consider connections to each other through creative activities. We will also be giving students packs of LEGO® and asking them to continue their reflective practice in their own time, and to reflect on the value of this for their own self-understanding and wellbeing. Indeed, this is a process that produces “productive discomfort” (James and Brookfield, 2014: 7), yet as “everyday creativity” also evokes feelings of “joy” (Gauntlett, 2018: 76). As such, affective practice with LEGO® is indeed paradoxical: it captures ideas but releases feelings, it is individual and communal, and it transcends but also reinscribes practices that are construed as constraining. LEGO® objects can become ‘subjects’ in their own right. It is these ‘paradoxical’, ‘messy’ elements that we look forward to exploring, as our research necessarily will prompt us to reflect on our own assumptions and practices as researchers. The copyrights to the photos are with the authors. Participants have given permission to use the photographs. LEGO, SERIOUS PLAY, the Minifigure and the Brick and Knob configurations are trademarks of the LEGO Group, which does not sponsor, authorize or endorse this academic work by by Jo Collins, University of Kent, and Nicole Brown, University College London, UK. Beeler, K. D. (1991), “Graduate student adjustment to academic life: A four-stage framework”, NASPA Journal, Vol. 28, No. 2, pp. 163-171. Brown, N. (2017), “The construction of academic identity under the influence of fibromyalgia”, In: Henderson, H., Pennant, A. L., and Hand, M. (eds. ), Papers from the Education Doctoral Research Conference, 26 November 2016, Birmingham: University of Birmingham. pp. 18-25. [Online] Available from:http://epapers.bham.ac.uk/2979/1/Full_Book_Research_conference_November_2016.pdf [Accessed on 1 November 2018]. Brown, N., and Leigh, J.S. (2018), “Creativity and playfulness in Higher Education research”, In: Huisman, J., and Tight, M. (eds. ), Theory and Method in Higher Education Research Vol.4. United Kingdom: Emerald Publishing Limited, pp.49 – 66. Corey, S. (1953), Action Research to Improve School Practices, New York: Columbia University, Teachers College Press. Elliott, J. (1991), Action Research for Educational Change, Buckingham: Open University Press. Gauntlett, D. (2018), Making is Connecting, Cambridge, MA: Polity Press. Giddens, A. (1991), Modernity and Self-Identity: Self and Society in the Late Modern Age, Stanford: Stanford University Press. Goffman, E. (1959), The presentation of self in everyday life, New York: Anchor Books. Herman, C. (2010), “Emotions and being a doctoral student”, in: Thomson, P., and Walker, M. (eds. ), The Routledge doctoral student’s companion, Abingdon: Routledge. pp. 283-294. Hochschild, A. R. (1983), The Managed Heart, Berkeley, CA: University of California Press. James, A. and Brookfield, S. D. (2014), Engaging imagination: Helping students become creative and reflective thinkers, San Francisco: Jossey Bass. Kamler, B. and Thomson, P. (2014), Helping Doctoral Students Write, London: Routledge. Lewin, K. (1948), Resolving Social Conflicts, New York: Harper. McGinty, M., and Water-Adams, S. (2006), Action Research in Education, Plymouth: University of Plymouth. Metcalfe, J., Levecque, K., Wilson S. (2018), Exploring wellbeing and mental health and associated support services for postgraduate researchers, Cambridge: CRAC. Morrison Saunders, A., Moore, S., Hughes, M. and Newsome, D. (2010), “Coming to terms with research practice: riding the emotional rollercoaster of doctoral research studies”, in: Thomson, P., and Walker, M. (eds. ), The Routledge doctoral student’s companion, Abingdon: Routledge. pp. 206-218. National Union of Students (NUS) (2018), Mental Health in UK Universities [Online] Available from: https://www.nus.org.uk/en/news/mental-health-in-uk-universities-uea-students-union-foi-results/ [accessed on 23 September 2018]. Reason, P., and Marshall, J. (1987), “Research as personal process”, in: Boud, D. and Griffin, V. (eds. ), Appreciating Adult Learning, London: Kogan Page. pp. 112-126. Schön, D. (1983), The Reflective Practitioner, New York: Basic Books. Universities UK (2017), #stepchange: Mental Health in Higher Education [Online] Available from: https://www.universitiesuk.ac.uk/stepchange [accessed on 5 October 2018]. Universities UK (2018), Minding our future: starting a conversation about the support of student mental health [Online] Available from:https://www.universitiesuk.ac.uk/policy-and-analysis/reports/Documents/2018/minding-our-future-starting-conversation-student-mental-health.pdf [Accessed on 23 September 2018]. Wetherell, M. (2012), Affect and Emotion: A New Social Science Understanding, London: Sage.